Festive Friday Blog Hop Design 8 | Who Are You Calling Crafty? Welcome to your next stop on the Festive Friday Blog Hop. You should have just came from Laura Davidson’s Blog – Laura Lee’s Dream. Snow Theme Card #8 – I put this card away for a couple weeks and came back to it. I am glad I did because I got some real inspiration (I found my snow flake stamp roller). The card is a vertical card 4 1/4” x 5 1/2” when folded and was constructed on Blue card stock made by Canson (I have had it for years!) I took my Color Box Pigment Stamp Pad – Treasure and wiped the silver to create streaks over the blue paper. 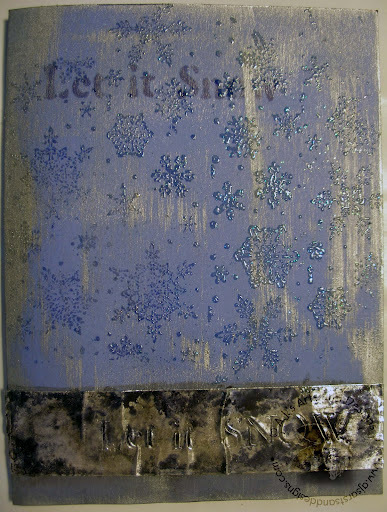 I then added Metal Tape to the bottom and embossed Let it Snow… with a letter stencil I had. I also added let it snow with the same template with a Fine Blue Sharpie Marke. I took my Roll-a-graph Snowflake stamp and used my Time Holtz Embossing Pad and added Iridescent embossing powder to the snowflakes. I also used my homemade blue alcohol ink to the metal tape. Thank you for stopping by “Who Are You Calling Crafty?” Now time to hop on over to Debbie Buckland’s blog Arty Crafty. I really like the snowflake background paper. Great job. love the way you use the metal tape. I love that stuff too..
Love the embossoing of the snowflake rollograph! Very pretty! Great job Manda! Great card, love the background. « Everything Easter on In the Paint Box Today!